At the combine, Carolina Panthers head coach Ron Rivera had some interesting quotes regarding sophomore-to-be wide receiver D.J. Moore. Well, first of all, I have to wonder if Rivera isn’t a PFF Elite member, based on his reference to Moore’s yards-after-the-catch numbers (which subscribers can access for themselves here.) Rivera was right – among all 93 wide receivers to see at least 40 targets, Moore ranked second (behind only Dante Pettis) in yards after the catch per reception (7.91). Secondly, and more importantly, these quotes are highly encouraging for Moore’s 2019 fantasy prospects. It seems Rivera is ready to embrace Moore as his WR1 and make a more concerted effort to get the ball in his hands. As we should all know by now, volume is everything for a fantasy wide receiver. Even before Rivera’s backing, with Devin Funchess now in Indianapolis and Greg Olsen possibly weighing retirement for greener pastures in television, Moore should have been in line for a massive uptick in targets anyway. Of course, Funchess’ departure was something we all should have seen coming, and Moore was already being treated as the team’s WR1 toward the tail-end of the season anyway. Yards after the catch also wasn’t the only area where Moore excelled. Among all 47 wide receivers to see at least 75 targets, Moore ranked fifth in yards per target (10.3). Among all 79 wide receivers to see at least 50 targets, Moore ranked first in missed tackles forced per reception (0.31). What does this all mean? 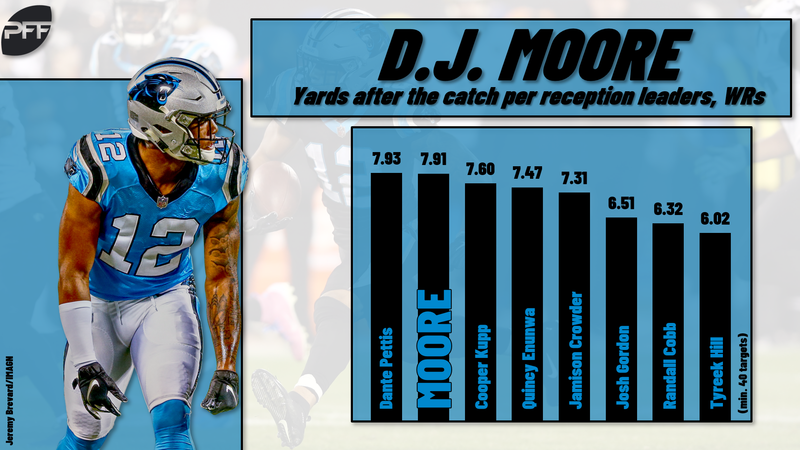 Well, clearly, Moore is a highly talented receiver on the verge of a massive uptick in volume. He’s likely to draw a tougher cornerback schedule next year, but that should be more than made up for by the target-increase. Moore will rightfully be one of this coming fantasy season’s most hyped assets. After reading these quotes from Rivera, I’m prepared to bump him up in my rankings to the low-end-WR2-range.